Certainly not forgotten. Despite it no longer being the Halloween season, we still wanted to share this new custom Squadt by our French buddy, Teimaru! Following up on his [SPOOK] SQUADT from 2017 (read HERE), Teimaru has given this Terror Boy the ALBINO makeover! From the depths of the Squadt Asylum, FORGOTTEN Terror Boy [SPOOK ALBINO] SQUADT was last seen on Halloween night. Disappearing into the foggy night, hunting for the very souls that entrapped him into a lifetime of soul searching. Teimaru sculpted & cast the pumpkin Squadt helmet, with some slight differences from his last year custom, and a different colour schema. He wanted to match the albino theme Ferg gave us with some releases (like the Playge Doc Albino Squadt), but with some of his own dirty work to match the halloween theme and the sculpt Teimaru made. 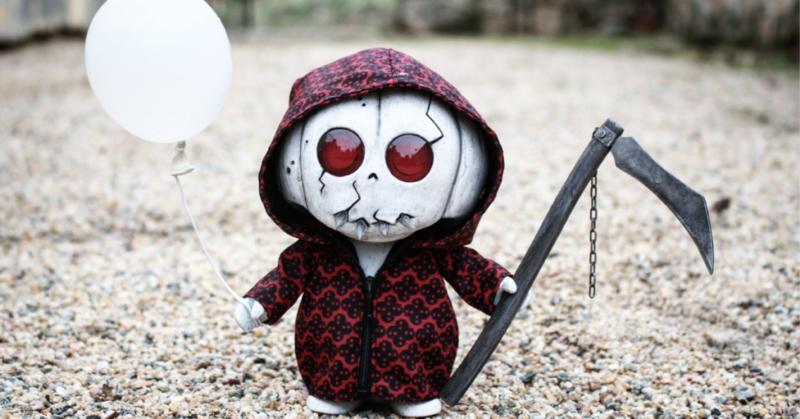 [SPOOK ALBINO] SQUADT has a custom suit (reworked tone of Ferg’s revolve pattern, propriety of Ferg), a custom scythe made from resin (resin cast), custom lenses to match the red Teimaru wanted, and a little white balloon, cause SPOOK Albino is cute as hell, nope?! We love seeing what Teimaru does with his favourite Squadts. Did you check out his post from 2017 when he told his thoughts on when Ferg said goodbye to the Squadts? You can check it out HERE. Teimaru can be found on Instagram HERE!